FreedomWorks and our local tea party allies in Ohio are teaming up to support Governor Kasich's union reform agenda and stop ObamaCare in its tracks this November by urging our members to vote YES on Ballot Issues 2 & 3. When SB 5 was passed last spring, it helped balance Ohio's budget by giving local governments desperately-needed flexibility to renegotiate certain aspects of public sector union contracts. It also introduced a system of merit pay for public employees, while asking them to contribute a small percentage of their income to their own benefit and pension plans. Voting YES on Issues 2 & 3 will keep these reforms in place, and pass Ohio's own version of the Health Care Freedom Act, both of which are vital to improving the business climate in Ohio and bringing private sector jobs back to the state. Click HERE to download your absentee ballot and vote YES on Issues 2 & 3 today. Unsure where to mail in your ballot? Click HERE for the address of your local Board of Elections. To show that we stand with Ohioans, FreedomWorks and our allies have launched a grassroots campaign to educate voters on the importance of Issues 2 & 3. 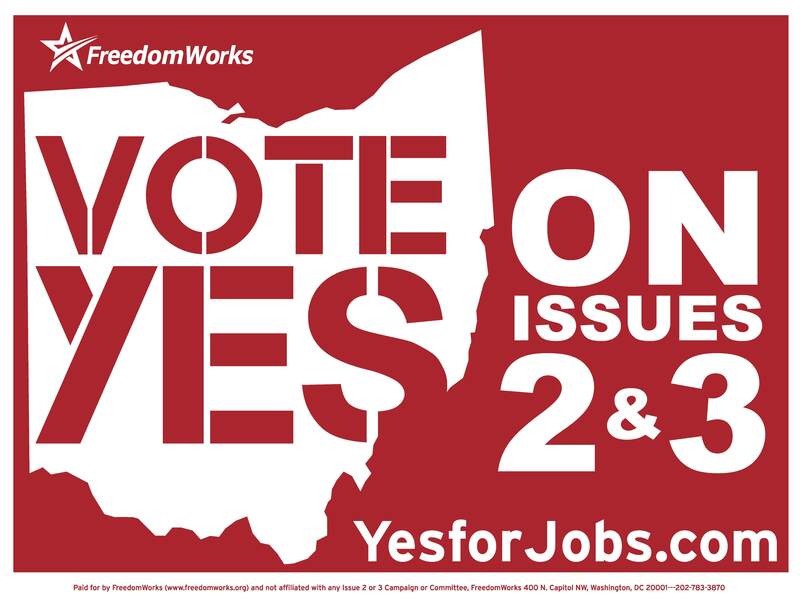 We have distributed tens of thousands of "YES on Issues 2 & 3" door hangers and yard signs so far, with more on the way. FreedomWorks has also created door hangers that can be downloaded and printed at home. Go HERE to download and print your own. We're also looking forward to participating in other events around the state between now and November. If you would like to help organize or host an event in your city, please let us know by emailing dspielman@freedomworks.org. It's important to remember that this fight isn't just about Issues 2 & 3. It's about sending a message to public servants everywhere that government exists to serve the people, not the other way around. Where do I get yard signs? I would agree with your views that every program should be made in terms with taking to consideration of the people who would benefit from it. Health Care Freedom Act is a good one if its tailored something like which the people would be easy to use and attain. For example : <a href="http://www.hccmis.com/short-term-medical-insurance/">short term medical insurance</a> . Ohio should fight hard for their success. The Chicago Teachers Union went on strike Sunday night, citing such issues as compensation, health benefits, and job security. Chicago is out of money, the State of Illinois is even more out of money, and in tough economic times, no one has job security. After a long weekend of learning how to be a better activist and learning how to continue grassroots movements in their perspective states, patriots from different states in the nation were so passionate about the cause that on Monday afternoon once the training sessions were formally over they took to Capitol Hill to lobby. The activists were led through the senate buildings by some staffers and interns from FreedomWorks and given information and talking points about the Utility MACT and S.J. Res. 37. FreedomWorks is excited to be coming back to Ohio next month for our first grassroots road trip of the 2012 election season!We'll be kicking off the tour in Troy with a Get-Out-the-Vote training session before continuing on to Cleveland and Toledo to help train and organize the great activists there.I hope you can join us for at least one of these exciting events.As you know, 2012 is a pivotal year for Ohio and America. From ObamaCare to EPA regulations, radical and dangerous policies are killing jobs across the country and preventing an economic recovery. On November 8th, Ohio voters will decide on two critical ballot initiatives, Issues 2 & 3, that have national implications for the Tea Party movement. If both measures pass it will be a huge victory in our efforts to stop ObamaCare and the corrupt influence of Big Labor. FreedomWorks and our tea party allies in Ohio are teaming up to support Governor Kasich's union reform agenda and stop ObamaCare in its tracks this November by urging our members to vote YES on Ballot Issues 2 & 3.When SB 5 was passed last spring, it helped balance Ohio's budget by giving local governments desperately-needed flexibility to renegotiate certain aspects of public sector union contracts. On Thursday evening, the New Jersey assembly passed a landmark bi-partisan overhaul of the public employee benefit and pension system. The bill passed the assembly by a 46-32 vote with 14 Democrats voted with Republicans for the bill. Now all that is needed is a signature from Governor Christie who has already touted the success of the bill’s passage. Anti-school choice activists converged on Washington D.C. to protest against school choice for all Pennsylvania students. The activists were remarkably uninformed on the issue and asserted many straw man arguments and class warfare demagoguery, into a debate focused on allowing all students access to quality education. On March 31, Ohio Governor John Kasich signed SB 5 into law during a televised ceremony, finally limiting the abused power of public sector union collective bargaining in the Buckeye State. FreedomWorks supported passage for this vital legislation by organizing local activists, forming petition drives and holding rallies around the state. The fight against public sector unions in Ohio is heating up. SB 5 has passed out of a key committee and will hit the Senate floor any minute.The unions are pushing hard on state senators, and even lying about the bill. Supporters of SB5 need your support NOW. This is a chance for Ohio to stand strong in the face of union threats and lies, and they need all the support they can get! Please TAKE ACTION NOW!